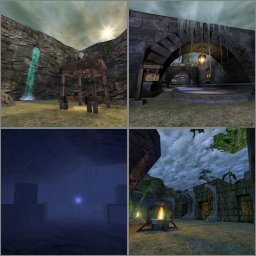 Map Description "D�j� Vu - Gryphon Revisited" is the UnrealSP.Org Anniversary Map Pack. A month before our two-year anniversary, we set out to build a large SP saga in four weeks - and released the much improved v2.0 a year later. The sixteen maps herein represent the successful culmination of the efforts of a team that was composed not only of experienced mappers but mapping novices too, who were still seasoned and valued members of the Unreal community. "D�j� Vu - Gryphon Revisited" takes you back to the mystical planet of the Nali people. The story sees you crash-land on the planet's surface after a retrieval mission goes wrong. You will face familiar threats with a familiar arsenal in your hands, but the locations and hazards will be unfamiliar to you. Mappers include Hellscrag, Sarevok, Lightning Hunter, Naveed, Drevlin, Frieza, Rogue, zynthetic, Waffnuffly, MMAN UGITU, Willis, Maekh, Eightball Maniac, Mr. Prophet and Techno JF. Requires Oldskool Amp'd to play (the mod is included in the zip). Deja Vu now has full Oldskool Coop support. THE SP stands for single player?? If so, how do I run it in UT? As a DM with no bots?? Or I need a mode? It is nice work! I mean it! But the looks are nice. 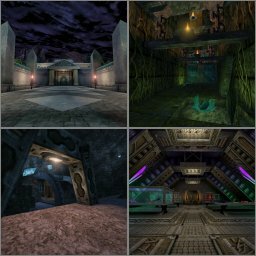 The mod required is called OldSkool, and it's included in the download. Yep, Nahand, fully patched to 2.01. GTD-Carthage - I'm not aware of Nali City having any SP reviewers at present, but there should be a detailed and independent review of the pack at http://www.unrealsp.org/ within a couple of weeks. EDIT: Okay, Nahand, thanx for the tip. "you guys should make another! ;)"
Ghost - Deja Vu was just the warmup! Someone should request a review for this stuff! It's the only single-player pack I've seen around ever since ONP. There are some very good levels in here. The first half or so is a bit inconsistent and retains a lot of the problems from the first release. After that, the maps range from good to excellent, with the possible exception of the new one with the boss gasbag which I thought could have been left out. I preferred the transition to the (previously nonexistent) Skaarj base in the original. The end map was pretty lame, too, I'm afraid. Hm... after a bad start with too many foes and destroyed atomsphere, the SP shows its strong points. Graphics are top notch, as well as the atmosphere, here and there are triggered sequences so that u don't fall asleep. Its a pity that there are some minor flaws here and there. But still a recommandable download. Much more solid and fun overall. Graphics still lack some consistency although the latest aditions are nice. Still shows the game is on and some people refuse to let it go :) Gladly. And FINALLY, I managed to get at least two cents of my own into this project...unlike last year's attempt! it looks like I'll have to do a clean reinstall of UT. Most levels you know exactly where to go. That's the impression I get. Some are a bit confusing (thinking about that temple level with the enormous ammount of translator messages). Map 15 surprised me the most. What lightning_hunter did to that map, is truly beyondunreal ;-) so to speaK. Seriously, he brought that map to live. It oozes atmosphere, it's fun to play. Waffnuffly's level well... it's looks stunning. But it's still too busy. About the ammount of enemies: reducing them was a good idea, because there's so much in your view it's hard to spot them sometimes. Not sure about the titan. It's ok, but maybe you should've placed him a bit further. Maybe near the end of (you know what). I've ran this in glide a couple of times, and on some of the earlier levels (one temple-ruins level and a base level) my ut/pc completely froze. On the other maps all was fine. One map dissapointed me however. The end map is, I hate to say this, boring. Despite the excellent visuals, despite the fact that it's quite atmospheric. On the other hand, Deja Vu 2.1 is worth the download. Once again, if you love playing unreal this is a must have. Nostalgia, but mixed with uptodate unreal feel. Team UnrealSP would like to thank everyone here for playing the pack and leaving their feedback. Any further comments would be welcome. Keep an eye on the Team UnrealSP site for news on our Unreal sequel project, "Battle for Na Pali". I found this sp great and very funny to play, keep up the good work. It was great fun playing this thing and I hope to see more of it, didn't find any flaws what so ever. Thanks to everyone who took the time to comment. It's nice to see such a positive turnout for something we've put a lot of effort into. I have to admint, in terms of coop play the lst map does present some issues. John DiFool: I have strong doubts this was directly caused by playing DV. There are know OpenGL issues on Win98 but nothing that causes any kind of corruption. nice stuff you got here! i only saw a few bsp holes to whole time i played, and they were in more complicated bsp areas anyway....kept me pre occupied for about as long as ONP did, just about an hour short of that....i'm going to have to play this again on an easier skill level (Unreal on first try! :D) so i can admire the geometry a little bit more...wow. I agree about my map. I wasn't totally happy with it in the original and regret that I didn't have any spare time during the course of v2. to really broaden the map. Also, my sp gameplay in ANY other SP map I've made is far more interesting. This is the only SP map I've released where I was not in charge or co-founding the project, and as such I really didn't have the drive to alter my mistakes due to other projects taking up my time. Play the SP campaign 7 Bullets to see my better stuff, search Nali City for the link or simply click my name and look under associated authors.